"I have many PDF documents that I use iBooks to open and read. Those PDFs are now in iBooks and I would like to access them on my PC. There must be some easy way to transfer these books from the iPhone to my PC. Any suggestions?" Downloaded or purchased books from iBook store or other book app on iPhone and now want to backup these books on your computer? Many tutorials teach you how to load PDFs into iBooks on iPhone, but few offers guides on how to backup or transfer them back to computer. Please don't worry, this user guide will offer you the full solution on how to transfer books fromiPhone Xs Max/Xs/XR/X/8 Plus/8/7 Plus/7/6S Plus/6S/6 Plus/6/5S/5C/5 to computer (Windows PC or Mac computer) with/without iTunes. Just follow the steps we mentioned in this article to achieve your goal. This way will show you how to attach books from iBooks to email so that you can download the books from email on your computer without iTunes. However, please be noted that this method only enables you to transfer one book at a time and also you need to download the books from email one by one if you need all of them. This is quick time-consuming. Importantly, not every book in iBooks are exported. Besides, you need to have an email address on your computer so that you can start to copy books from iBooks to PC with iTunes. Step 1. 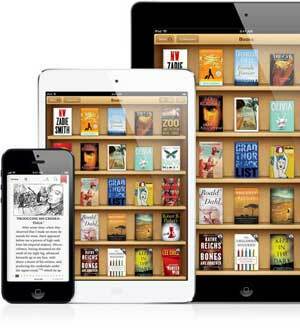 Launch iBooks app on your iPhone or iPad, and go the Library where you can see all your downloaded books displayed on the bookshelf. Step 2. Select and open a book that you want to read or transfer to computer. On the top of screen, you might see a Share icon. Just tap the Share icon to move on. Step 3. 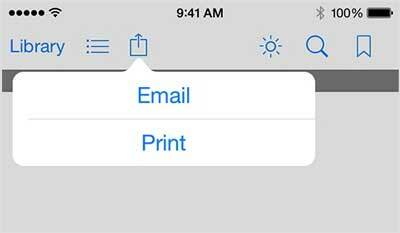 Tap "Email" option from the pop-up window, then you will be navigated to email screen with a file attached. Step 4. Follow the screen and enter your email address that you can access on your computer and send it. Later you can log into your mailbox on your PC/Mac to download books that you have sent from iBooks. How to Transfer iPhone Albums to Computer (PC/Mac)? When you want to transfer data for iPhone/iPad/iPod, iTunes is always your first choice. And also you might have known that iTunes can help you transfer books between iPhone and computer, however, the truth is that iTunes can't transfer non-purchased books that downloaded online between iOS device and computer due to copyright problems. Anyway, if have bought books in iTunes Store and you only want to sync purchased books from iPhone to computer, you can also rely on iTunes to finish the job. Now please refer to the following user guide to transfer purchased books from iPhone to computer, and this guide will take windows PC for example. Step 1. Connect your iPhone to computer with a USB cable, then iTunes will automatically launch. If not, you can manually start it on your computer. Besides, please make sure you are running the latest iTunes on your computer. You can download the latest iTunes on your Windows PC here, or you can also go to "Help" > "Check for Updates" on iTunes to get the latest iTunes version. Step 2. On the left top of corner on iTunes window, please click "File" > "Devices" > "Transfer Purchases from " to preview all the books on your iPhone. Step 3. While previewing, please select the targeted purchased eBooks from iPhone to iTunes Library, and confirm it to start transferring. Later, you can check the transferred books from the iTunes Library on your computer. iTunes has its limitation. Even though iTunes allows you to transfer purchased books from iPhone to computer, iTunes doesn't enable you to transfer the non-purchased books or downloaded eBooks from other e-reading apps except iTunes Store. So is there anyway to transfer both of purchased and non-purchased books from iPhone to computer, either Windows PC or Mac computer? The answer is YES. In order to transfer purchased or non-purchased books including audiobooks, ePub or PDF eBooks, etc. from iPhone to PC, you need a professional iPhone Book Transfer as your assistant - Coolmuster iOS Assistant (Windows/Mac). With it, you can easily and quickly export all your iPhone books to computer with the original quality without iTunes. And it provide users with two different preview modes, so that you can quickly locate your target books for transferring. Also, you can directly import/export/delete books on iPhone directly on computer with this iPhone Book Transfer easily. 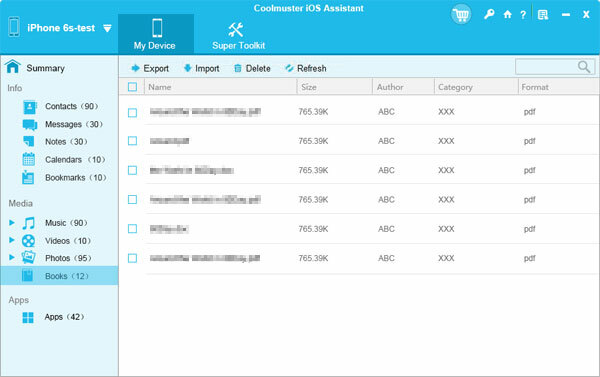 Actually this Coolmuster iOS Assistant works for iPhone/iPad/iPod devices, and it is fully compatible with almost all iOS devices, including iPhone Xs Max/Xs/XR/X/8 Plus/8/7 Plus/7/6s Plus/6s/6 Plus/6/5S/SE, iPad Pro, the new iPad, iPad Air, iPad 2, iPad mini, iPod touch/Shuffle/Nano/Classic and etc. So if you have eBooks on your iPad or iPod, you can also use this program to manage your e-Library. 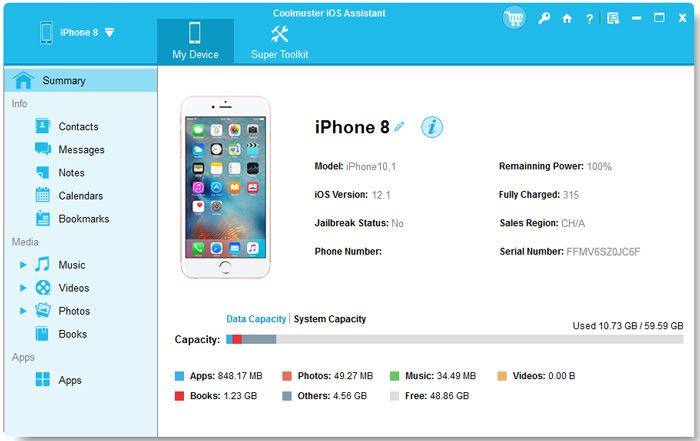 As a professional iPhone Book Transfer program, Coolmuster doesn't require any technical skills for both beginners and experts. You can click the below icons to get the powerful program and then follow the instructions. This guide is specially written for Windows user. 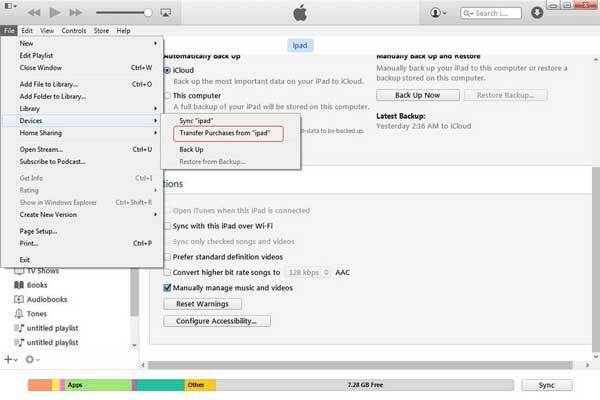 If you're a Mac user, you can follow the same steps on your Mac computer, too. First of all, connect your iPhone to computer with a USB cord. Then launch this iPhone Book Transfer on your PC. 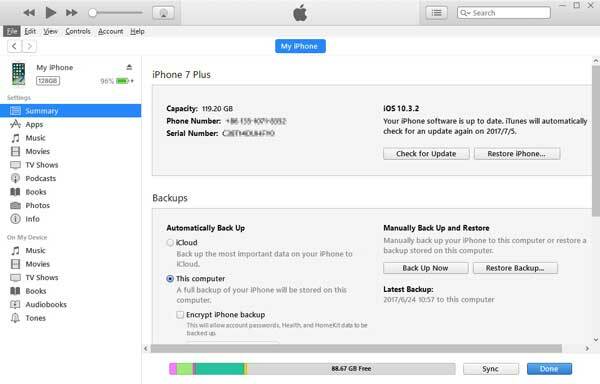 After that, you will see your iPhone info in the main interface just like the below picture shows. Secondly, click "Books" or "AudioBooks" in the left panel to see the detailed info of all eBooks or audiobooks on your iPhone. Just select all files you want to transfer and then click "Export" button to start transferring books from iPhone to computer right now. After the transferring process is finished, a pop-up window will appear and ask you that whether to open the output folder immediately. You can choose "YES" or "NO" to check the output files according to your own specific needs. Note: To have better understanding, please watch the video tutorial about how to transfer books from iPhone to computer as below.